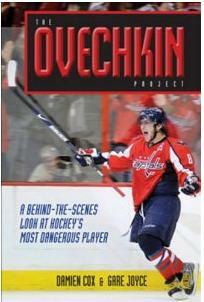 Two of the bigger names in hockey journalism (Damien Cox and Gare Joyce) combine forces to bring us the new book The Ovechkin Project: A Behind-the-Scenes Look at Hockeys Most Dangerous Player. The book, however, disappoints. It is written with a negative theme, as if the authors' mandated their vision right from the outset. I heard one of the authors (Joyce) try to defend their approach as painting him as tragic figure. I don't buy it. The book reads as if the authors go out of their way create an image of a spoiled prima donna more interested in the spotlight than winning. The book is split between two storylines. The first is of Ovechkin's youth in Moscow, where they treat his mother as a controlling freak, detached from emotion and pushing him too hard. On the other hand they treat his father as a happy-go-lucky dolt. They should have spent more telling us about the effect his brother's death had on him. While they touch on the subject, it should have been given much more time to what undoubtedly was a life changing event. They end the book on this note, but it should have been the book's theme if they were truly attempting to paint him as a tragic figure. The authors then jump ahead to his established life in America as the star player and face of hockey. They gloss over his early career highlights and dominance that got him there, and jump right into comparing him endlessly to Sidney Crosby. Which is fine, because we all do it anyways. But they use it to no end to point out all of Ovechkin's shortcomings in order to make him appear to be a flawed and lesser hockey star. I think what disturbs me the most is how different of a view the authors give us from the public image we all have of Alexander Ovechkin. We all know him as the fun loving, electrifying superstar hockey player who everyone loves. The authors go out so far out of their way to paint a different picture that we do not recognize the Ovechkin they write about at all. Washington Capitals owner Ted Leonsis said so much himself, and he knows the real behind-the-scenes Ovechkin better than most. It is one thing to offer a critical view of Ovechkin. But this book immediately reeks of a biased mandate to contrast him from his public persona. The authors go at long lengths to do so. Why? Damien Cox has a long history of going out of his way to be controversial. So his influence here does not surprise. He does himself no favors in his much publicized defense of the book, coming across as an insecure fool. Gare Joyce has a much cleaner record and has always been known as a top writer. It is noteworthy though that he previously wrote a glowing biography of Sidney Crosby. I expected more objectivity and professionalism. But controversy is good for business, I guess. Even if it comes at the expense of others, in this case Alexander Ovechkin. But the bottom line is the book's #1 audience target - the legions of Alexander Ovechkin fans - will not want to spend their money on this. Having signed the most lucrative contract in NHL history with the Washington Capitals, Alexander Ovechkin, at 24, is an undisputed hockey legend. In the mold more of a rock star than hockey player, Ovechkin courts the limelight, is never shy with his opinions, and, in a sport that thrives on the collective culture of the team-Ovechkin is an iconoclast who flouts convention, while loving the game. In The Ovechkin Project, veteran hockey writers Damien Cox and Gare Joyce trace his elite sports pedigree, his role representing Russia in the World Juniors, and how since entering the NHL, he's taken his team from worst to first in their division, and the hockey world by storm. A candid look at one of the most charismatic figures in hockey today, The Ovechkin Project offers an inside, little-known look at Ovechkin himself, the makings of his spectacular on-ice talent, and the Great 8's meteoric rise to the world stage of professional sports. It is a shame that trees and ink were wasted on this drivel. 320 pages of crap. I am an Ovie/Caps fan all the way, but will admit that he has had some "not so great" moments...esp. last season. That being said...he is one of the top two (myopinion top) players in the game and by far the most fun to watch. This bio is just another piece of evidence that the NHL/Canadians don't mind letting the Russians play with them...but certainly won't let them star in their own back yard. The Cold War is over people and this Russian Bias is getting annoying. The Russian culture is VERY different from the N-American one, but that is no reason to be so critical and zenophobic!